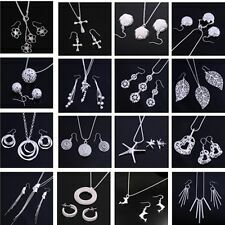 925 Sterling Silver set of earring and necklace. 17" chain and drop earrings for pierced ears. In original Kit Heath presentation box. Every £1 you donate will help us change a child's life. - Inspire our people and partners to unite behind our purpose. Silver Ortak Bangle And Ring Set. Dispatched with Royal Mail 1st Class. Never worn brand new condition. Very pretty pale pink real pearls in this necklace and marching bracelet set. Necklace is 18" long and bracelet 7.5". Clasps are lovely design and stamped 925 on side ( sterling silver). Pearls are nice size~ lovely classic jewellery. In excellent condition. Comes without box. Please see photos. I on,y post within uk. Thanks for looking. Sterling silver necklace and earrings. Both feature turquoise inlay. Colour dulling and small scratches present in areas, would benefit from clean and polish. 3cm pendant drop. Stones are well set. Item Specifics. The pendant has a drop of approx 34mm including the bale and the earrings have a drop of approx 26mm. I don't really know much about this set other than what is on the label inside the lid. The pendant has a drop of approx 37mm including the bale and the earrings have a drop of approx 26mm. I don't really know much about this set other than what is on the label inside the lid. Marked 925 to both necklace and earring. As the UK's number one heart charity, the cutting edge research we fund has already made a big difference to people's lives. Support the British Heart Foundation's life saving research. Both pieces are marked 925. Set with genuine green amber. 2.5cm pendant drop. 18" chain length. Light marks and scuffs present in areas, would benefit from clean and polish. Stones are well set. Item Specifics. Features Swarovski crystals. Silver plated. Bow-shape 925 Silver & Diamond necklace & earrings set - NEW. 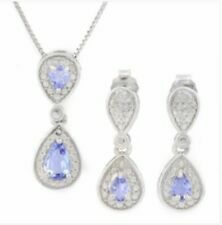 925 Silver & Diamond necklace and earrings set. 2 chain lengths - 41cm or 45cm. set with genuine Diamonds. "925 " or "SS"represents certified "Sterling Silver "and is stamped on Jewellery to demonstrate the high quality of the product.This stamp represents the fact that the piece of Jewellery you are buying consists of 92.5% Genuine Silver, which is the highest it can go. Acid tested to confirm silver. Pre owned and still in good condition. Acid tested to confirm silver. Keep the magic of childhood alive with Disney's Winnie the Pooh 14 carat Gold electroplated Sterling Silver Necklace and Earrings set. Your favorite honey-loving bear reminds us that you're braver than you believe, stronger than you seem, and smarter than you think. 925 Silver Hollow Hearts Necklace, and Earring Set. The whole set includes the Necklace Chain & Pendant, One pair of Earrings, and a Free Jewellery Pouch. "925 " or "SS"represents certified "Sterling Silver "and is stamped on Jewellery to demonstrate the high quality of the product.This stamp represents the fact that the piece of Jewellery you are buying consists of 92.5% Genuine Silver, which is the highest it can go. ESPRIT Pendant Earrings for pierced earlobes. Straight Bars in Brushed Silver 925. Simple, elegant, stylish. Overall length 45 mm. This is a beautiful and refined, sterling silver, necklace and bracelet set. Bracelet length - 18.5 cm. Necklace length - 46 cm. 925 SILVER NECKLACE AND DROP EARRINGS WITH-34 ALL DIFFERENT REAL PEARLS-WEDDING? EACH PEARL IS DIFFERENT ALL HAVE THAT BEAUTIFUL RAINBOW LUSTRE. ON THE NECKLACE ALL 30 PEARLS SHINE AND LOOK AND ARE REAL, FROM A HUNDRED YARDS. THAT SOPHISTICATED GENTLE,MOTHER OF PEARL LUSTRE- NOTHING ‘BLINGLY OR OSTENTATIOUS HERE- JUST THE FINEST OF THE FINEST QUALITY. Honora Pearls set new in box. Necklace, bracelet and earrings. 925 silver earring mounts. Never worn. Beautiful set. From a smoke free home Thanks for looking. The ring matches the earrings perfectly but has a second zircon to balance the design and add to its beauty. Stud Size - 0.7mm. Includes presentation box. Marked 925. Pendant - 2cm. Light scratches are visible on outer surfaces. As the UK's number one heart charity, the cutting edge research we fund has already made a big difference to people's lives. Solid925 Silver Bracelet and necklace. Weighing in at a combined whopping 28.3 grams of pure silver. Hallmarked 925. All samples are slightly different to one another and whilst they may appear to look similar they all have subtle differences which may not be noticeable on first inspection. Handcrafted pendant earrings set made of eco-friendly 999 Fine Silver which is pure silver (99,9% silver). Hand sculpted and handcrafted in the UK. These unique earrings made of 999 Fine Silver which is pure silver (99,9% silver). Both pieces are marked 925. 4cm pendant drop. 16" chain length. Light marks and scuffs present in areas, would benefit from clean and polish. 6.8g weight. Support the British Heart Foundation's life saving research. Both pieces are marked 925. Slight colour dulling and small scratches present in areas, would benefit from clean and polish. 16" chain length. 2.5cm drop. As the UK's number one heart charity, the cutting edge research we fund has already made a big difference to people's lives. New & Genuine - A Beautiful Howlite (total 99 carats ) Elasticated Bracelet & Matching Earrings Set. The bracelet is elasticated, so easy to get on and off. The howlite gemstones have been drilled and then hung from sterling silver shepherds hook fittings. BROUGHT IN A STOP IN BRIGHTON LANES. CHOKER NECKLACE HAS FEATURE FRON AND CAN BE SIZED TO FIT NECK 48 GRAMS IN WEIGHT. EXQUISITE, INTRICATE and UNIQUE. NECKLACE/ BRACELET EARRINGS. 925 SILVER JEWELLERY SET. Bracelet - 20cms in Length from bar to edge of loop, 18cms to first loop. Width - 2.5cms. Necklace - 41.5cms in Hanging Length from the clasp to last droplet dangle that hangs between the breasts. What a Gorgeous set this is. Consisting of a Necklace, Ring and Earrings this set has it all! Gemstones, Diamonds and Beauty all st in 925 Sterling Silver. SUPERB SET WEDDING FAVOUR! GENUINE PINK FIRE OPAL SET COMPRISING OF NECKLACE AND EARRINGS. PRICE CRASH DOWN FROM £49.99 TO £39.99 FOR A. Stone Type: CREATED FIRE OPAL. SET IN. 925 SOLID STERLING SILVER WITH A FREE 18" SINGAPORE CHAIN. Swarovski silver necklace and matching bracelet no box unwanted gift beautiful . Dispatched with Royal Mail 2nd Class. Brushed silver pendant and matching earrings by Kit Heath ! Very pretty and nice clean lines. The Earrings are for pierced ears and have butterfly keepers. Can be gift wrapped if requested. Quality Amber and 925 Silver Pendant and Earrings Jewellery Set. Boxed. I have three super earring and pendant set. They are unused gifts that have been kept in various draws and not worn. This is a beautiful quality amber and 925 stamped silver jewellery set I think the photographs show the beautiful deep cognac amber colours. AN OUTSTANDING 13 CWT SET IN SOLID STERLING SILVER. 925. BEAUTIFUL DEEP BLUE AAA GENUINE TANZANITE & DIAMOND SET COMPRISING OF EARRINGS NECKLACE AND RING! Stone Type: LAB TANZANITE. RING SIZE 8 CAN EASILY BE SIZED UP OR DOWN. New & Genuine - A Beautiful White Quartz (total 88 carats) Elasticated Bracelet & Matching Earrings Set. The bracelet is elasticated, so easy to get on and off. The white quartz gemstones have been drilled and then hung from sterling silver shepherds hook fittings. SUPER 3.06 CWT CLEAR WHITE AQUAMARINE 925 STERLING SILVER SET. GENUINE EARTH MINED STONES. Stone Type: AQUAMARINE. Stone Information. Stone 1 Type: Gemstone. Stone Size: 4X6mm. Stone Carat: 1.06. Stone 2 Type: Gemstone.